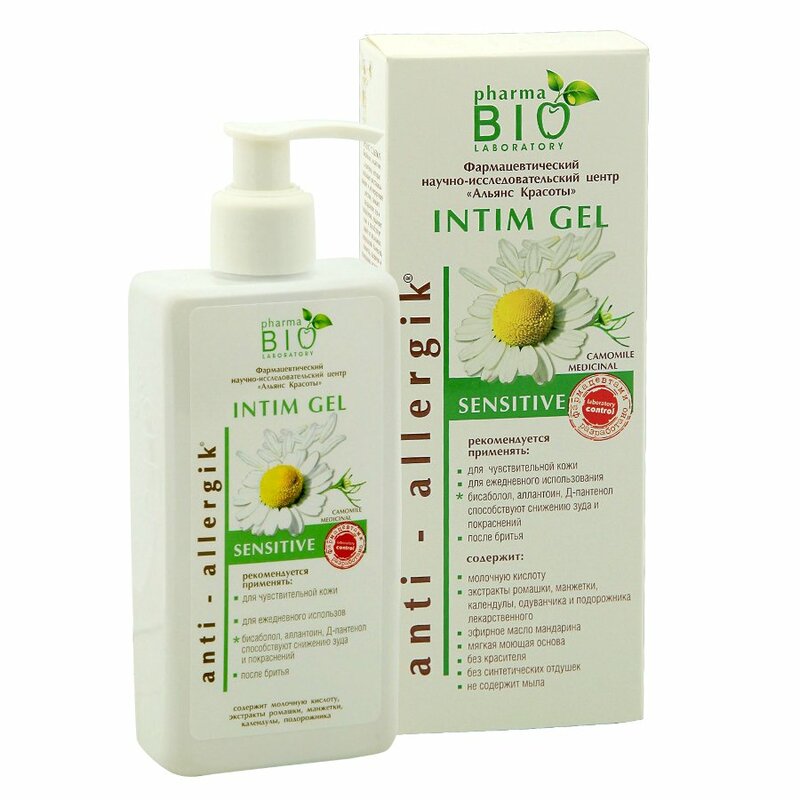 Sensitive Intim Gel is an intimate cleansing gel produced by the Ukrainian personal care brand Pharma Bio Laboratory (Bio Pharma). It is specifically designed for women with overly sensitive skin in their lady areas, prone to irritation caused by shaving, synthetic underwear, cosmetic and hygienic products. The product is formulated with high-quality ingredients that have been carefully selected to produce a gentle cleansing effect and to prevent skin irritation. Sensitive Intim Gel by Pharma Bio Laboratory contains medicinal herb extracts, including chamomile extract, marigold extract, dandelion extract, and plantain extract. These extracts have a soothing and anti-allergic effect. They also stimulate skin cell metabolism and make the skin healthier. The product is enriched with bisabolol, allantoin, and panthenol. These ingredients relieve irritated, itchy and red skin, produce a moisturising effect, and protect the delicate and sensitive skin of your intimate parts from harmful environmental factors. Sensitive Intim Gel is suitable for everyday use. It can be used after shaving. Free of colourants, soap, parabens, synthetic fragrances, SLS and SLES. Directions. Squeeze some gel onto your palm, lather, apply to intimate parts. Rinse thoroughly. For external use only. Ingredients. Aqua, Disodium Laureth Sulfosuccinate, Cocamidopropyl Betaine, PEG-4 Rapeseedamide, Coco-Glucoside (and) Glyceryl Oleate, Sodium Chloride, Glycerin, PEG-40 Hydrogenated Castor Oil, PEG-150 Polyglyceryl-2 Tristearate (and) PEG -6 Caprylic/Capris Glycerides, Lactic Acid, Extract Chamomilla Recutita, Extract Calendula Officialis, Extract Taraxacum Officiale, Extract Plantago Major, Panthenol (and) Water, Styrene/Acrylates Copolymer (and) Coco-Glucoside, Allantoin, Polyguaternium-7, Hydroxyethyl Urea, PEG-7 Glyceryl Cocoat, Hydroxypropul Methyicelluloze, Bisabolol, Citrus Nobilis (Mandarin Orange) Peel Oil, Benzyl Alcohol, 5-Chlor-2-Methyl-4-Isothiazolinone. Want to buy Sensitive Intim Gel? Call us or submit your order via our web site!